250mg × 90 tablet $ 1.14 $ 102.95 Buy Now! 250mg × 120 tablet $ 1.04 $ 124.95 Buy Now! 250mg × 180 tablet $ 1.01 $ 180.95 Buy Now! 250mg × 360 tablet $ 0.91 $ 325.95 Buy Now! 500mg × 30 tablet $ 2.73 $ 81.95 Buy Now! 500mg × 60 tablet $ 1.93 $ 115.95 Buy Now! 500mg × 90 tablet $ 1.68 $ 150.95 Buy Now! 500mg × 120 tablet $ 1.54 $ 184.95 Buy Now! 500mg × 180 tablet $ 1.43 $ 257.95 Buy Now! 500mg × 360 tablet $ 1.30 $ 467.95 Buy Now! 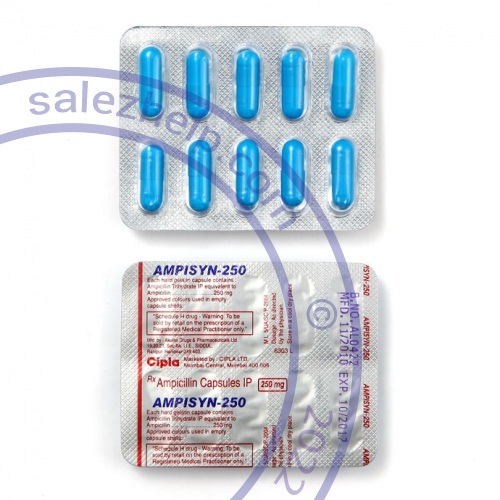 AMPICILLIN is a combination penicillin antibiotic. It kills or stops the growth of some bacteria. This medicine is used to treat many kinds of infections, like urinary, respiratory, skin, gastrointestinal, and bone infections. It will not work for colds, flu, or other viral infections. Take this medicine by mouth with a full glass of water. Take this medicine on an empty stomach, at least 30 minutes before or 2 hours after food. Do not take with food. Take your medicine at regular intervals. Do not take your medicine more often than directed. Take all of your medicine as directed even if you think you are better. Do not skip doses or stop your medicine early.